This tutorial will explain how to manually work out shadow diagrams for Melbourne, Australia, so get your calculators ready. First thing we need to be able to draw shadow diagrams is some data based on the sun. This information will allow us to work out our shadow lines length and rotation. As shadow diagrams are based on hourly increments that is what we will use. The data I have provided is based on the September 22nd equinox for Melbourne, Australia. Based on the information we have, we can use trigonometry to help us work out the shadow line lengths for our shadow diagrams. The other information we need is the wall/roof height at the point we are going to work out. 3000 / tan(30.9) = 5012.63mm long shadow line. 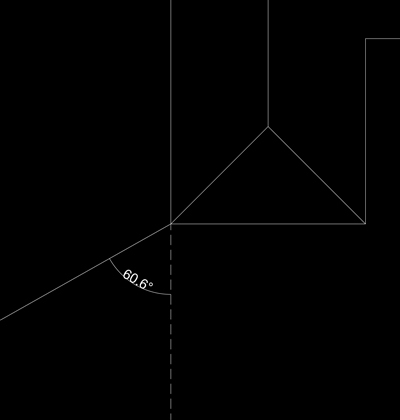 Now we have our shadow line length, next is to draw the shadow line on the correct angle on the plan. The shadow line angle is the azimuth from our sun data which is 60.6 degrees. So, from south being 0 degrees, in a clockwise rotation the line will end up as shown in the diagram above. This is how shadow diagrams are worked out. Using my software, Shadow Multi Cast, you can quickly and easily create these shadow diagrams accurately.